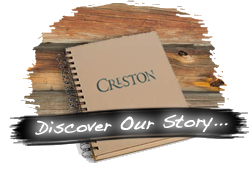 The Creston entrance is located 8 miles south of the charming town of Black Mountain. From Exit 64 at Black Mountain: Creston is located 8 miles south of Black Mountain. From I-40 take the Black Mountain Exit # 64 and go south on Route 9 for 6.5 miles. Follow the signs for Creston & turn left onto Crooked Creek Road. Go 1.5 miles to our entrance on your left at the waterfall. Travel approximately two miles to the top of the mountain where you'll see the office on the right, across from the Community Center parking lot. From Exit 73 at Old Fort: Creston is located 9 miles south of Old Fort.Â From I-40, take Exit 73 andÂ go south (McDonald's on right)Â on the Bat Cave Rd for 4 miles.Â Â Watch forÂ our directional sign at Crooked Creek StoreÂ (right) andÂ turnÂ right onto Mt. Hebron Rd.Â Go 4 miles toÂ the Creston entrance on your right. Follow the directions stated above to the Creston Model Home. From Lake Lure, Chimney Rock and Bat Cave: For those travelingÂ RouteÂ 9 from Lake Lure, Chimney Rock and Bat Cave take Hwy. 9 North from Bat Cave approximately 14 miles and watch very carefully for a quick right onto Crooked Creek Rd.Â Then follow theÂ directions given from Black Mountain. The latitude of Creston is 35ï¿½ 34.538' N. The longitude is 82ï¿½ 14.201' W.
It is in the Eastern Standard time zone. Elevation is 3,110 feet.